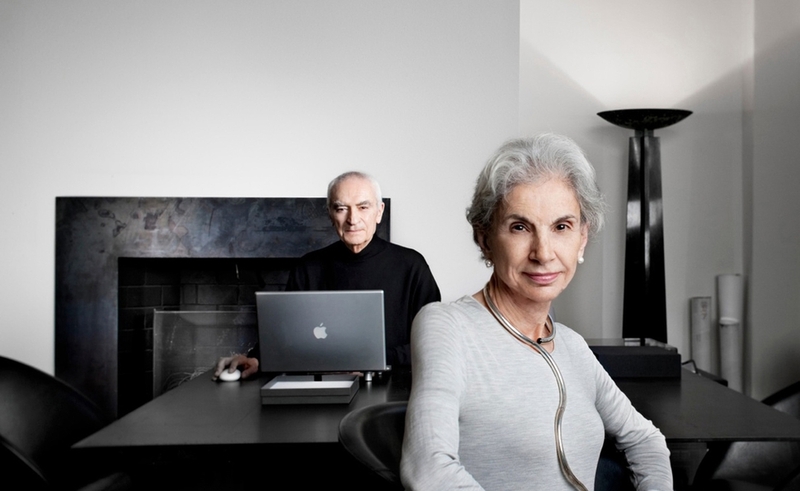 An affectionate documentary guided by the same principles championed by its subjects, Design Is One: Lella & Massimo Vignelli takes an efficient, minimalist approach to portraying the careers of the Vignellis, two of the world’s most influential and important designers. Born in Italy, they came to the United States in 1957, and immediately made a splash thanks to projects that melded unfussy form and functionality, most notably their creation of the New York City Transit Authority’s subway maps and signage, as well as their iconic logo for American Airlines. In both instances, Massimo’s love of the Helvetica font (which he claims he introduced to America) and interest in using simple, grid-like formal designs made his work a sensation, and helped launch a 51-year partnership with his wife Lella, whose architectural background and expertise were the perfect natural complement for Massimo’s more graphic-centric skills. Over the ensuing five decades of marriage and collaboration, Massimo and Lella dabbled in so many fields—furniture, jewelry, architecture, flatware and silverware, clothing, corporate branding, publishing—that their work is now ubiquitous. Following their lead of prioritizing what’s most necessary and jettisoning everything else, Design Is One eschews traditional bio-doc conventions by largely ignoring its subjects’ upbringing, or any in-depth discussion about their personal lives, except insofar as that pertains to their careers. Driven by copious interviews with the couple, and consistently overlaying violin-scored photographic montages of their immense output over interview soundbites from Massimo, Lella, and numerous colleagues and admirers, Kathy Brew and Roberto Guerra’s documentary boasts an economical sleekness that’s in tune with the designers’ concepts. While a few dissenting voices might have provided a bit more contextual depth—since presumably, not everyone is gaga over the Vignelli style—Design Is One provides such copious evidence of their inventive genius that the proceedings rarely come across as unjustifiably fawning. Instead, like Massimo’s simple designs, it’s an elegant non-fiction effort, one that understands the Vignellis’ lives have always been defined by their work. He the dreamer and she the realist, Massimo and Lella come across as a pair in perfect harmony, in terms of both temperament and design know-how, with both promoting the idea that unlike art, design adheres to its own sets of values, the most fundamental of which is that it must be utilitarian. In other words, design is concerned not only with aesthetics (or entertainment), but also with practical everyday applications. Through its depiction of Massimo’s use of grids, Design Is One also conveys how proper design helps bring order to the world, in the process shaping it as well. The amusingly egotistical Massimo makes no bones about the fact that one of his professional goals is to affect the lives of millions via works that will far outlast him, as with his favorite creation, Manhattan’s St. Peter’s Church. Whether through an exhibition at NYC’s Museum Of Modern Art, or the instantly recognizable corporate logos for (among innumerable others) Ford, Bloomingdale’s, and Knoll, Design Is One argues that his objective has already been deservedly achieved.